Pictured are Simon B. Chandler, C.H. Gifford, J.C. Jones, D.H. Starns, H.L. Davis, Elizabeth Morgan, Cam S. Holbrook, Leslie Anderson, Ila Pettus, O.B. Fallis. 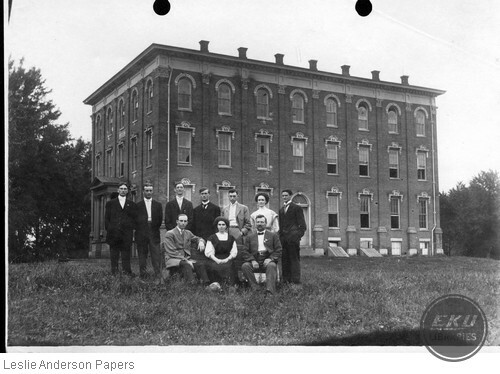 unknown, “Eastern 1909 graduates behind the University Building,” Digital Collections, accessed April 24, 2019, https://digitalcollections.eku.edu/items/show/1891.